COVERDERM Finishing Powder - A translucent, hypoallergenic, loose powder that blends perfectly into the make-up and renders radiance and silky texture to the face. 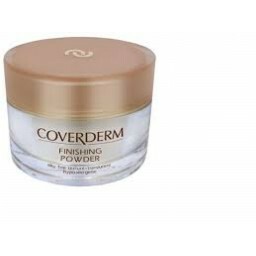 COVERDERM Finishing Powder - A translucent, hypoallergenic, loose powder that blends perfectly into the make-up and renders radiance and silky texture to the face. It is the ideal powder to set the Camouflage make-ups and completes their natural looking effect throughout the day. Being translucent it matches perfectly with all make-up shades. Ideal to absorb sebum and sweat. Talc, Magnesium Carbonate, Methylparaden, Parfum, CI 77491, CI 77492, CI 77499, CI 77007. Apply on COVERDERM Classic Foundation or COVERDERM Perfect Face Foundation and allow to set for 2 minutes, to set and seal the foundation. Dust off excess with a brush for a for a natural finish. Well priced. Beautiful product to give a soft and mate look on your face.